Water House on Main Street are newer Breckenridge CO condos on the south end of Main Street in Breckenridge Real Estate. Built in 2008 there are 26 units in the first of two buildings at Water House on Main Street. The makeup of the 26 condos is 2 one bedrooms, 15 two bedrooms and 7 three bedrooms. The Breckenridge condos range in size from 755 – 1,847 square feet. Each unit is tastefully finished with wood floors, stainless steel appliances, slab granite counters and stone fireplaces. Located just beyond Main Street Station makes for a short walk to both Main Street and the Quicksilver Lift at the base of Peak 9 of the Breckenridge Ski Resort. Many Breckenridge condos for sale at Water House on Main Street are adjacent to the babbling Illinois Creek. Sitting out on your spacious deck you may have views of Maggie Pond, the Ten Mile Range which includes the Breckenridge Ski Resort or Baldy Mountain. Individual ski lockers can be found on the first floor of Water House while the majority of the other amenities can be found at Main Street Station. These amenities include an outdoor pool, several hot tubs, fitness room, steam room, sauna, movie viewing rooms and more. There is also underground heated parking. Water House on Main Street are superb Breckenridge condos in an ideal location steps to skiing and Main Street for shopping and dining. 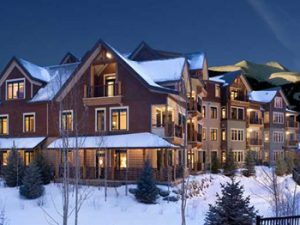 Arrange a time to view condos for sale in Breckenridge Colorado Real Estate today.